« Should I stay or should I go now… to a cheaper fund? My family were quite early adopters of what was then called a “home computer”. We started in 1984 with one of those overgrown keyboards you connect to your TV, but in the late 80s my mom spoilt us with a really futuristic machine called a compaq. It could show 16 colours and had a very weird joystick called a mouse. It even had something called a C drive which meant we no longer had to swap floppy discs halfway through playing a game. We loved it, and thanks to the fact that there was no way the games could phone home to report piracy, my neighbours and I copied games with abandon! One of our favourites was called Sim City (the 1989 edition). 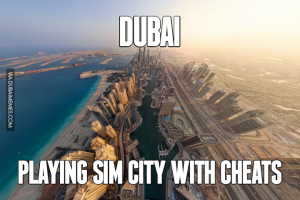 In this game you were a virtual mayor and had to decide where to put shops, factories and houses, build roads, airports, power stations and repair damage from all the earthquakes and monster attacks that kept happening. Your goal was to make the biggest, coolest city around. Every now and then the game stats would pop up telling you how you were doing. You’d get to see the how much money you had, how happy the people were, and what their biggest complaints were. If the biggest complaint was the high crime rate, all you had to do was put another police station in the high crime areas. If they complained about traffic you’d just build more roads and trains, but if high taxes was the biggest issue you had a much more challenging problem. Lowering taxes would make people happier, but you might run out of money and wouldn’t have enough for services, repairs and growing your city. Make it too high and people would simply move away and you’d end up collecting far less in taxes since you’d have far fewer taxpayers. It really was a delicate balance. Sadly it’s a balance that our government hasn’t quite worked out. Over the last few years the tax rates have been creeping skywards. Income tax went from 40% to 41% in 2016. It had been there for 14 years while our country wasn’t broken. This year it jumped to 45% if you’re luckily enough to earn over R1.5 bar. Capital gains tax didn’t even exist in SA before 2001. Then they made it a 25% inclusion into income tax. That lasted until 2012 where it went up to 33.3%, and again with nothing in the kitty left to steal this year it was upped to 40%. Dividends tax (formerly secondary tax on companies) used to be 10%. In 2012 it was upped to 15%, and then last year it was raised to 20%. Yes, in the space of 5 years the dividends tax rate has doubled, and us poor investors have just stood by and watched. Imagine what would happen if VAT or income tax doubled in 5 years, there would be a mutiny. I can think of a few people I’d like to see in this outfit. Sadly after so many years with their snouts in the trough they just won’t fit. It’s also one of my least favourite taxes. As investors we work really hard so we can save for our futures. We invest money we’ve ALREADY paid tax on, into companies that will employ people and add value to our lives. I plan to live on these dividends, something many of our current pensioners to some extent do. Now I may have to work longer and save more to make that possible, but if I was a pensioner that just wouldn’t be possible. Thanks for working so hard your whole life gramps, now empty your pockets. The government keeps quoting the fact that we were lower than the OECD country average. I’m not buying that though. The OECD countries include Finland, Sweden, Denmark and Germany where you get a hell of a lot of value for money with taxes. If I don’t need to pay for medical aid, private security services, school fees or university fees among others then I’d happily pay the 20%, but that’s just not the case. There’s also the fact that in many OECD countries there is an exempt amount of dividends, and the rate isn’t actually as high as you’d imagine. In the UK the first £5000 (R84 000) is completely tax free, and unless you earn over £45 000 a year (R750 000) you won’t pay more than 10% on those dividends. In the USA you won’t pay any dividends tax unless you earn over $37000 (R480 000). Another question is why are we all of a sudden comparing ourselves to first world countries when we like to trumpet how much we admire our fellow BRICS members. Brazil pays 0% in dividends tax, Russia 13%, India also 0% (they abolished the tax in 2002) and China also won’t charge you a cent as long as you’ve held the shares for over a year. In the BRICS club we’re comfortably the worst! All of this is going to make people emigrate. They’ll go somewhere where they’re treated better. If you’re not able to to that, you’ll be happy to know that like we saw with capital gains tax, when it comes to dividends tax, there is a workaround. With one change to you portfolio, you should never pay 20% dividend tax unless you earn over R1.5 million a year. In fact, you could be paying under 10% in dividends tax. Depending on how much dividend and other income you earn, it could be as low as 8%. If you’d like to know how this is done, all you have to do is buy my ebook for $49.99. I guarantee that if following my techniques doesn’t get you paying a lower rate in dividend tax I’ll send you my favourite french poodle. I’m kidding of course. Fortunately I’m not a slimey internet salesman, and I’m quite fond of my tiny poodles. The simple answer is that all you need to do to pay less dividend tax is invest offshore. 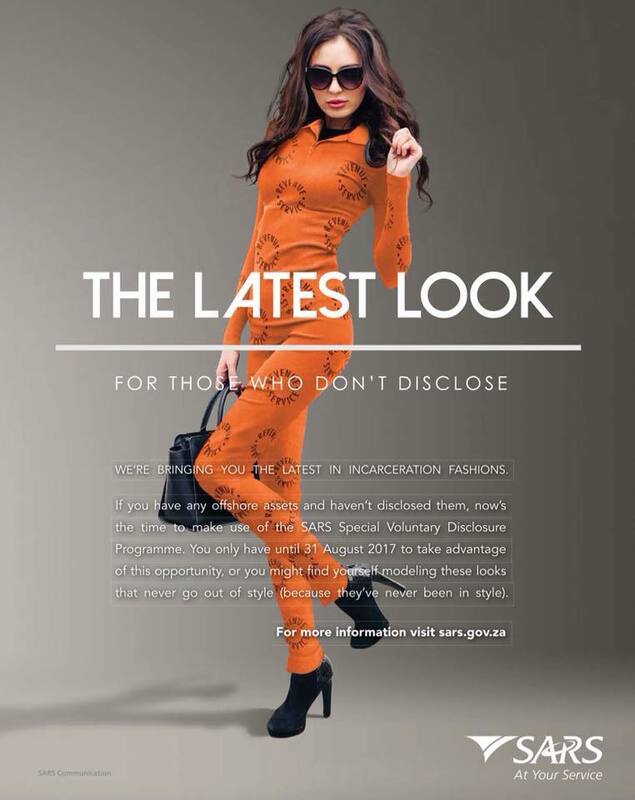 And I don’t mean by hiding funds offshore either, hardly anyone looks good in orange. If you invest offshore, you can legally pay less dividend tax with the full blessing of SARS. 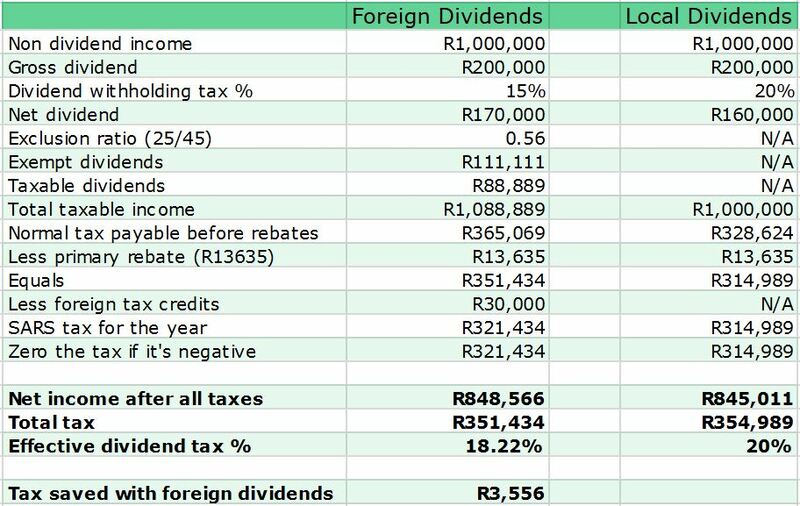 Foreign dividends are taxed as if they were income and not dividends, but to avoid a case where you might end up paying 45% in tax on dividends, they exempt some of the dividends from tax. The exempt portion is calculated with a ratio which is (maximum tax rate-dividend tax rate) divided by maximum tax rate. For 2017/18 year, the exemption ratio is 25/45 or 55.5% meaning you don’t pay tax on 55.5% of foreign dividends, leaving you with 44.4% of dividends you do pay tax on. This ratio means that only those who earn enough to be put into the top tax bracket will pay 20% tax on their foreign dividends. Happily, or sadly rather, I’m not earning the R1.5 million needed to fall into that tax bracket, and if you’re spending your working hours reading this, you’re probably not either. To work out how much tax we’d need to pay you need to add 44.4% of your foreign dividends to your income for tax purposes. Now if you’re thinking this won’t make a huge difference as you already paid 15% in dividends in the country you’re invested in then you need to hear this good news: Even though you only pay tax on the 44% of your dividends, you get to claim 100% of any foreign taxes paid as a tax credit! That means that the tax credits may be higher than the tax you actually should have paid, which would mean SARS would give you a break on your regular income tax to make up for it! John is a highly paid corporate executive. He earns a million rand a year and has built up a huge share portfolio. This year he expects to pull in R200 000 in dividends. Let’s compare the difference is they’re foreign or local: I imagine you’re thinking “What, all that effort for a miserable R3.5k saving in taxes?”. If that’s the case, please send me R3500, I could put it to great use, and then read the next example. 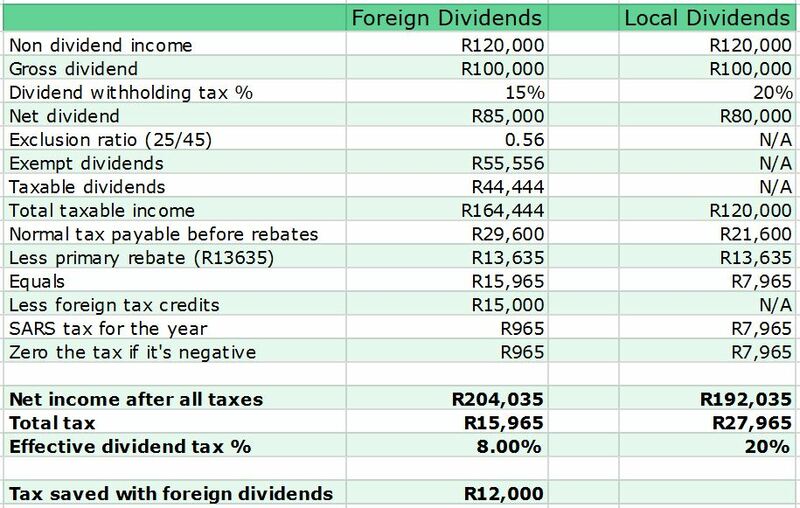 Sarah is semi-retired, just doing part time work for R10 000 a month, and receives R100 000 a year in dividends: As you can see, the total amount of tax owed by Sarah is almost as much as the tax she’s already paid overseas on her dividends. That means she has effectively overpaid tax on her small salary throughout the year and so will hopefully get all but R965 back when she files taxes. She’ll have an extra R12000 a year to spend simply by investing offshore. Effectively is paying just 8% tax on her dividends! What this shows us, is that offshore investing isn’t just something for the rich. In fact there’s a far greater incentive for those earning smaller salaries to get their investments offshore, particularly if you’re needing your dividend income to live on. I’m not a tax professional nor a financial adviser. Don’t do anything drastic until you have spoken to one. I have run the above article past a very knowledgeable tax layman, and a financial adviser. I’ve also sourced as much of my information from the SARS site and other tax authority sites. The links are here: link 1, link 2, link 3, link 4, link 5. To save time you can also check the other tabs in the spreadsheet as I’ve copied and pasted the relevant sections. You could also check by running the calculation on your e-filing. If I’ve made a mistake somewhere please let me know and I’ll update this post. Where is the spreadsheet? It’s here. Note that it’s a shared document, so if you edit it while someone else is you’ll end up in a fight. To solve that you can click on File -> Make a copy. 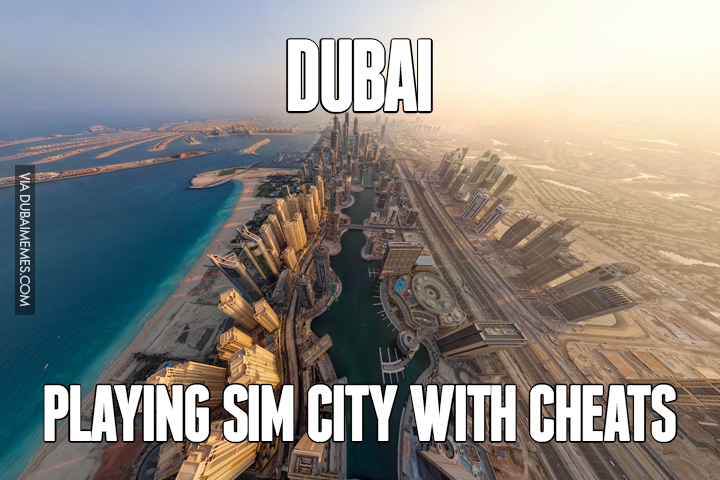 If you’d like to play the original version of Sim City you can do that here! Note that it might look a little odd, but you just need to click on System -> Load graphics -> Classic graphics and it’ll look just as you remember, if you’re as old as I am of course. Lately I’ve been hearing a lot of grumbling that people are unhappy and looking for ways to emigrate. The private schools group Advtech even listed it as a possible concern to shareholders recently. I thought I’d add a poll to see if it’s as bad as they say. Are you thinking of emigrating? I enjoyed your article and yes the concept is correct regarding foreign dividends and foreign tax credits – SARS will allow the deduction of foreign taxes ito Section 6quat and 6quin rebates, which will be offset against your normal tax. And as full amount of the tax credit is allowed and the ratio is not applied as when the taxable dividend is calculated, the benefit surely lies with the taxpayer. Where the foreign tax credit exceeds tax due it will be carried forward to the next tax year. If you’d like to get in touch with a tax adviser who understands these issues you can contact Annemarie Strauss on 079 979 2175.